Y'all!!! 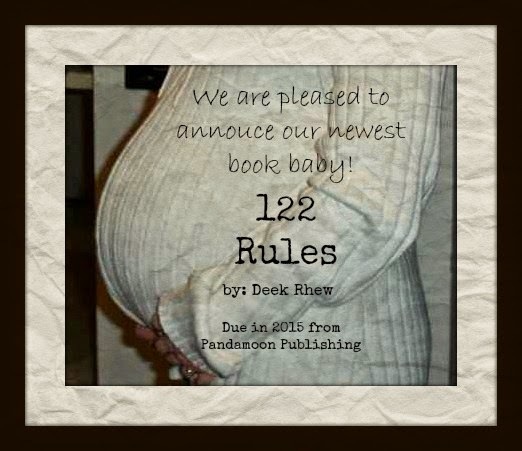 My husband, Deek Rhew, wrote a completely and totally amazing book called 122 Rules, and GUESS WHAT? It's going to be published! And it's going to be published by a totally amazing house called Pandamoon Publishing! I am so proud of my hubby! You guys, seriously, Deek has one of the most unique writing voices I've ever read (and I work for BookFish Books, a publishing house, so I read A LOT of books). He manages to combine literary elements with commercial appeal flawlessly. You'll be reading about a government assassin, yet there is such vivid, artistic imagery that you sit back and go "wow." There's action and adventure, combined with deep introspection. I can't rave enough about it, friends. And not just because I'm his wife but because it's a truly special book. I am in love with the story, the characters, and the writing. In fact, if you know our romance story, you'll know I fell for the writing before I fell for the man. I guess you could say I loved the writing so much I just had to marry the author. Haha! So, I've told you about the literary and commercial elements, but if you know Deek, you know there is HUMOR. The humor...O.M.G. You'll be reading along in this super intense moment, and then the humor hits. You'll be laughing your hiney off while still biting your nails. It's a truly unique experience. I can promise you there is no book out there quite like 122 Rules. I am so excited that the world will get to experience the brilliant mind and epic humor that resides in my husband's head. You'll be on the edge of your seat, you'll shed a tear, you'll be in awe of the writing, and you'll laugh...man, will you laugh. Since finding out Deek got the contract with Pandamoon, we've been a little Panda obsessed at our house. I think Deek has a whole post planned about that, so I won't spoil it. But here are some pics from this special time in our lives! This man, my husband, is a truly gifted writer, friends. I hope you will follow him on Twitter, Facebook, and Google +, and subscribe to his blog to keep up with his journey as he rides the publication train. And in 2015, when 122 Rules releases, I encourage you to buy a copy and go on a book adventure unlike any you've ever been on before! Erin, honey, thank you for being part of this journey. You've made it fun and exciting and there is NO ONE else I'd rather share this journey with...both the literary world and life. I love you, Erin! Love, it's all about the journey! And boy, have we had quite the ride so far!! There is no one I'd rather sit beside on this roller coaster called life!! Hand-in-hand with laughter on our lips...that's how we roll. I love you to the moon and back, my Deek! !